Throughout WUCC, we will be “embedding” with select teams and telling their stories with daily updates about their journey, history, and more. We call it Inside Break. In a rematch of the classic 2017 US Open final, Colombia Revolution played Denver Molly Brown in their final game of power pool play on Tuesday. Revolution won the game with an emphatic 5-0 run to close out the game with a 15-10 win, and it was clear that winning the game was a priority for the whole team. For one Revolution player, though, the game provided some conflict and extra stress: Manuela Cardenas, one of Revolution’s biggest stars and ultimate’s most famous personalities, has a history with Molly Brown. She played with them during the series of the USA Ultimate 2017 club season, and she very quickly became a loved member of the tight knit Molly Brown family. Cardenas suffered through some on-field struggles early in the game. She committed two red zone turnovers on the team’s second offensive point, and Revolution ended up getting broken. She credited her rough start with the conflict she felt in those early moments. “I felt super bad [and] confused in the first part of the game and I made so many mistakes,” she said. Cardenas ended up with two assists and two goals and threw just one more turnover after that two turn point. She ended up having a solid game despite the emotions she had to fight through before and during the game. But beyond her successful play on the field, she also regathered her customary contagious style of humor as well. On one point in the second half, there was a discussion about where the disc needed to be after a call. Molly Brown’s Dena Slattery suffered a slip of the tongue when she announced that the disc should be back with Manuela, and gestured to her twin Valeria. 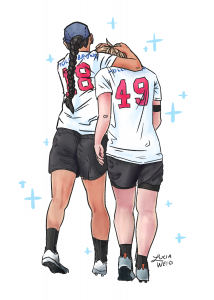 Manuela, who was actually on the sideline for the point, stepped onto the field and helped Slattery with her mistake by reintroducing herself to her old teammate, “Hey Dena, this is Valeria, I am Manu,” eliciting laughter from every player on the field and sidelines alike. Upon the conclusion of the game, Manuela hugged each and every Molly Brown player in the high five line once again and shared further laughs with her teammates — both Revolution and Molly Brown — in the spirit circle. There, it was clear that Manuela had brought both teams closer, and that the connection was not just between Manuela and her American team. Revolution had a special disc made to give Molly Brown as a gift, and head coach Mauricio Moore, who doesn’t usually participate in the players’ circle, made a speech thanking the Molly players for taking care of Manuela and telling them how proud he was that she had played with such a good team. Manuela is a naturally effervescent personality on the ultimate field, and that makes her a popular figure in the game. But it was clear in the early stages of the game that the emotions of the moment were affecting her. But with two ultimate families on the field with her, she was able to find comfort in a tough situation. As she said, she gave her best for both teams, and helped Revolution to a big win in the process. Comments on "Inside Break: Manuela On Facing Molly Brown"